The Hobby Horse has great form. Whoever made him had a great eye or a really good pattern as well as good woodworking skills and practices. The Hobby Horse has also been, well mauled. Someone cut off his mane and his ears. He's lost a stirrup and half his tail is missing. Plus he's quite tarnished and he has various nails driven into him in odd places. As I have been working on this section or that I have thought about who might have made him, when and why. And I have thought about a child altering him. The complex emotions someone goes through when they realize, 'Oops. I can't undo making Barbie bald'. 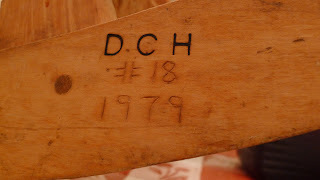 Last night I sanded the bottom rail where the horse has wood burned initials. Lo and behold, sanding revealed Mr Hobby Horse is dated. 11/18/1979. Day he was finished, day he was given to someone, someone's birthday? It's not clear to me yet what story my initials on Mr Hobby Horse will tell, maybe still maiming but with the skills to put Barbie's hair back on. Wonderful.